I was wondering what the second most played game at the club after The Resistance might be. This is a possibility. The key hook in King of Tokyo is "one against the rest" mechanic. Jumping into Tokyo and becoming that "one" is both empowering but also quite nerve-racking. I like Yahtzee! I like rolling dice and rolling them again! But this isn't an appropriate costume to dress up that game in. Dice rolling is the mechanic of luck: the unpredictability of war, discovery, and other chaotic outside influences. But the actions of the dice in this game are decisions: so do these monsters have no control over whether they rest, attack or, uh, victory point? Still, I do like Yahtzee, so the game has that, I suppose. 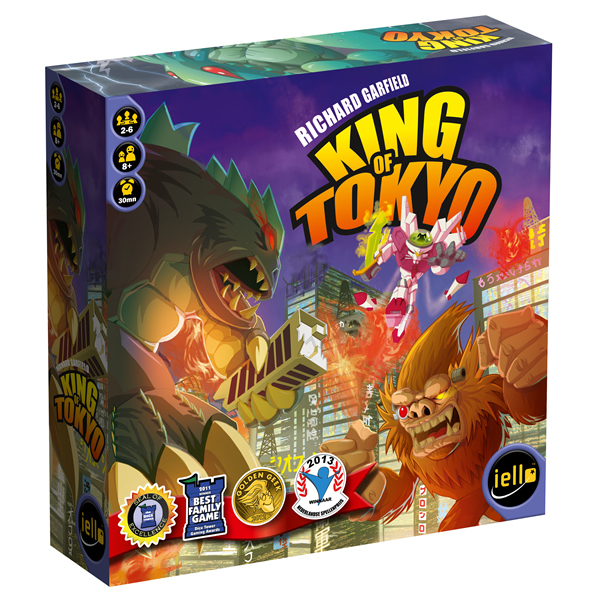 My final objection is that King of Tokyo is a super cartoony game. Like, one step above Munchkin. I just... don't care for this. How would you/should you thematicize Yahtzee? Each individual dice roll would be a potential thing, something that could happen if you pursue it. Maybe you are prospectors digging for precious minerals. Gold, Silver and Copper replace the numbers. Energy becomes "technology points" that you use to upgrade your equipment (it could be money but then why can't you "spend" your gold?). I would like to play Terror In Meeple City to see if it does the monster rampage thing better. I think I mostly agree, Sam. I own KoT and enjoyed it at first but I haven't enjoyed it that last couple of times I played it and I think your criticism's are mostly fair. Except that I quite like the art. I can bring RAMPAGE tonight if you fancy a try Sam... great fun! Only 4 player though!